In this episode, we sit down with Sarah Ortiz Shields to discuss her work at the Austin Tech Alliance. This week we sit down with John Thornton and John Garrett to chat about media trends. This week are joined by Jan Ryan for a special announcement about Women@Austin! This week we talk with Carla Piñeyro Sublett, Co-Founder, and Co-Chair of the Hispanic Impact Fund at ACF. This week, we sit down with Colin Kendrick and Matt Ott from Black Fret. Kirsten Dickerson founded Raven + Lily, a fair trade fashion and home retailer employing at risk women from around the world, after years of traveling and working in the nonprofit sector. Her travels brought to light these women’s desire for education and need for a marketplace for their skills and products. With help from friends in the design and fashion industries she established Raven + Lily. In this episode, we talk with Josh Baer about Capital Factory’s unique approach to fostering connections within their community, and the journey a startup takes once they walk through the CF doors. Capital Factory provides the space, mentorship, connections, and resources needed for first-time startup entrepreneurs to scale their businesses. Listen now! As the third largest foundation in the Central Texas region, ACF reflects what is unique about Austin and works to serve the needs of the community. Therefore, ACF raises funds so the needs of Austin, as they exist today and in the future, can be met. Nellis explains the new tool the foundation adopted, called Modern Giving. It is a digital platform that allows micro-giving into a donor-advised platform, in other words, an easier way to donate to a foundation of choice. Modern Giving is an easily adaptable tool for this generation because of its flexible structure that makes donating an effortless task. Listen now and learn how Austin Community Foundation continues to practice innovation! In this Episode, Zoe Schlag joins the team to discuss her journey in building Techstars Impact, the Techstars accelerator backing for-profit companies using new technologies to solve social problems. Brian Hall, Attorney and Advisor at Traverse Legal, PLC d/b/a Hall Law, Managing Partner Austin, TX Office and expert in IP law, takes a 360 approach when looking at the needs of a startup venture or nonprofit. Nonprofits often overlook their branding, trade secrets, data, and potential products that set them apart from other organizations or for-profits. Concentrating on impact often result in the failure to notice the ever-changing rules of the legal space. A little over two years ago, Wendy Davis founded Deeds Not Words in response to the millennial population's strong desire for political change. The organization encourage this motivated population to lead the conversation and take action to implement change by increasing voter turnout, getting involved in the political process, and demanding change from our political leaders. Listen now! On Episode 16 of Change the Rules, we sit down with Raj Patel, a British born American academic, journalist and award-winning author. His impressive career also includes a fierce passion for activism, which is where we begin today's conversation. Listen now, as we dive into what it really means to devote your life to advocating for a better tomorrow. This week we sit down with Josh Jones-Dilworth, Founder and CEO of Jones-Dilworth, Inc. and Dave Shaw, President of Arrow. We explore the specific branding, marketing, and public relations needs of nonprofits and social enterprises. Amplifying signal through the noise is a real challenge for impact organizations who are often operating with limited marketing dollars. Listen to these marketing expert's advice on how to increase and engage your organization’s audience! On this Episode of Change the Rules, we meet with David Smith CEO of the United Way of Greater Austin to discuss how our local chapter is innovating and generating impact. United Way of Greater Austin's mission is to bring people, ideas, and resources together in order to fight systematic poverty. They do this by continually evolving their practices, partnerships, and programming. On today’s podcast, we welcome self-made movie theatre mogul and beloved local philanthropist, Tim League, the CEO and Founder of Alamo Drafthouse. Anna Robinson joins us in a conversation about her organization CERESA, a platform that connects women leaders for radically better mentorship. The organization's goal is to foster genuinely beneficial relationships between mentor and mentee that help bridge the gap in women's leadership across the world. In this episode, we speak with Anna about the global women's leadership gap, why women often find it difficult to be mentored by men, and how more women than ever today are actively seeking out mentors. Listen to how this Austin organization is changing the rules of women's mentorship. HOPE Events is a nonprofit production company where artists and makers donate their time and talents to giving back. HOPE is also the founding organization behind the HOPE Campaign, HOPE Farmers Market, and the HOPE Outdoor Gallery. We are joined this week by Alan Graham, CEO of Mobile Loaves and Fishes and Community First! Village in Austin Texas to talk about his journey is helping the homless population. Our guests Kendall and John Antonelli join us this week to talk about their business, Antonelli's Cheese Shop. 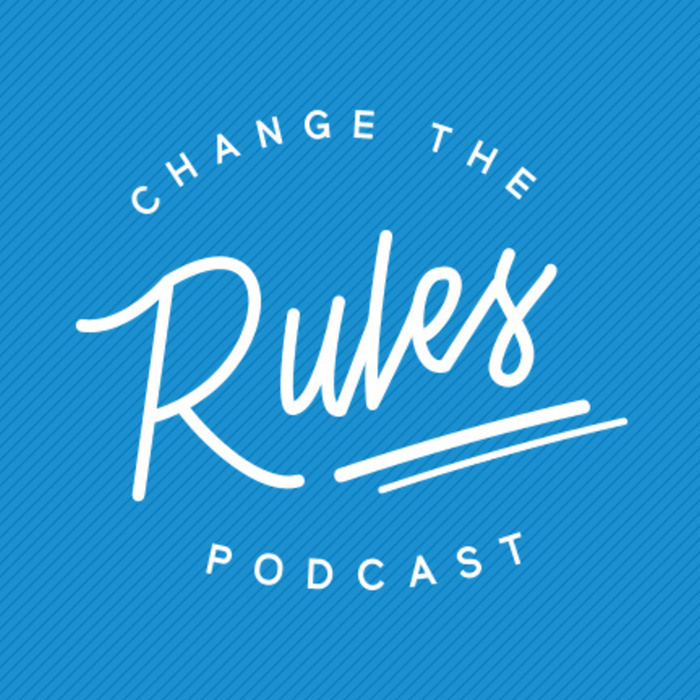 In this episode of Change the Rules we sit down with Leah Greenberg and Ezra Levine to chat about the tactics we must take in response to the current political climate. In this episode, we’ll speak with three special guests - Drew Galloway, Ryan Lugalia-Hollon, and Willy Ogorzaly - about the basic questions surrounding cryptocurrency and the blockchain and how these technologies are being used for social good. This week, we sit down Meredith Walker, Co-Founder and Executive Director of Amy Poehler's Smart Girls. Lisa and Dan Graham talk with John Gillum, the Facilities Planning Manager at The Austin Library. This week, we talk with Michael Hsu and Ryan Steglich about Springdale General and The Center for Social Innovation. Office culture is more than just ping pong tables and team building. Creating a RAD office culture begins with design. Today we talk with Royal Frasier, a founder of RAD Office Tour about how Austin businesses are leading the charge by developing unique office spaces that support and encourage unique company cultures. What will we do with the 500,000 people people moving to Austin by 2024? Was I-35 built as a way to separate minorities in Austin? What does CodeNEXT mean for Austin? When was the last time Austin edited the zoning laws? Listen now for the answer to these questions and more.